Opening weekend was an exciting way to start the season with three close matches against Gannon. Both teams had mostly rookies playing their first matches ever, but you would never know considering how well each team played. 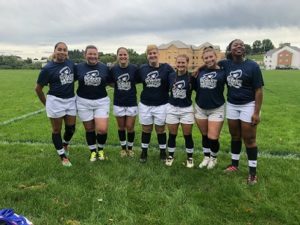 RMU started with exactly 7 players, and after suffering one injury played the remainder of the day with only 6 players and still found a way to win another match. Squad in their new warm ups prior to the match.